The A5R//ARE, traditional western body cutaway guitar, features all-solid rosewood back and sides with Sitka spruce top with Yamaha's original A.R.E. wood-torrefaction technology. Natural, dynamic plugged-in tone from the SRT2 pickup system perfectly suit your performance on the stage. Made in Japan. Vintage Natural finish. From cut-through piezo sound to warm, pure acoustic sound, which is like recorded with vintage microphones in the professional studio, SRT2 allows you to reproduce a sound that you can really use on stage. With SRT2 you can mix these two sounds to attain the exact balance you want to achieve a distinctive tone. A-series has louder and stronger in the low-mid ranges thanks to cutting-edge acoustic analysis technology developed by the Yamaha R&D Division. Their analysis led to the development of the new scalloped bracing for the top board and shorter bracing than normal for the back board. Also, treating the top board with Yamaha's exclusive A.R.E. 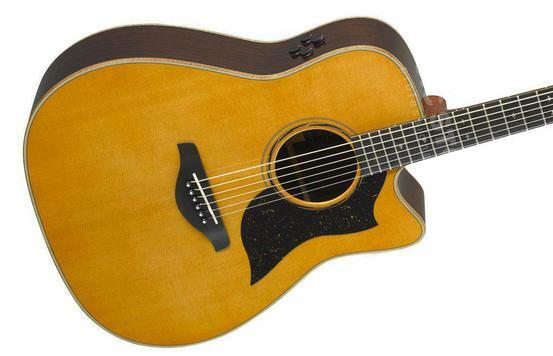 (Acoustic Resonance Enhancement) process gives the instrument a rich, vintage quality tone, making it sound as though you'd been playing it for year from the very first moment you pick an A-series guitar up. Made in Japan, the A5 is the flagship model in Yamaha A-series featuring Gotoh's renowned open-gear tuners, high-quality binding on the head, TUSQ nut and saddle etc.